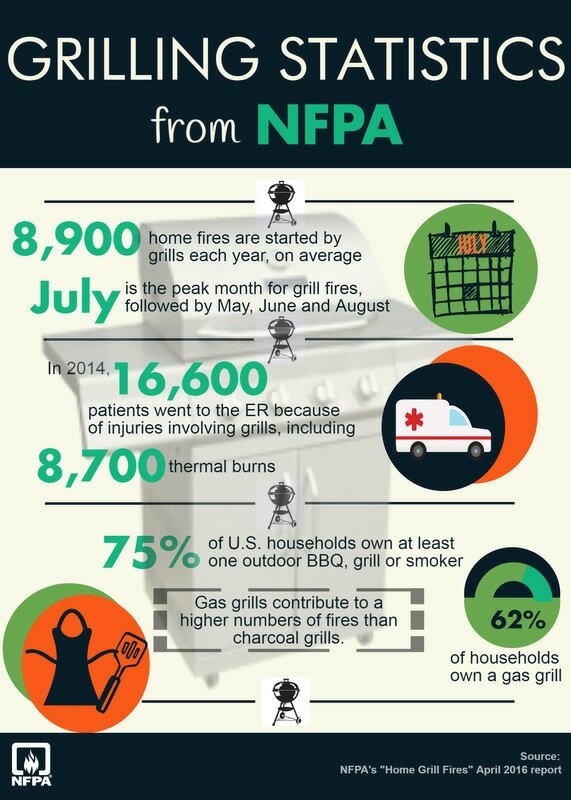 July is the peak month for grill fires (17%), including structure, outdoor or unclassified fires. Other high incident months include May, June and August. Failure to clean the grill was the leading factor contributing to the fire in 1/5 of all grill structure fires (19%). In 17% of fires, something that could catch fire was too close to the grill. Leaks or breaks were the leading factor in 11% of grill structure fires and 23% of outside and unclassified grill fires. Gas grills contributed to a higher number of home fires overall than their charcoal counterparts. Check out the facts and download some fact sheets and infographics at the NFPA website.